Chop cilantro. Peel cucumber, halve lengthwise, scoop out seeds with a spoon, and cut into slices. Peel red onion, cut in half, and thinly slice. Peel and finely chop garlic cloves. Finely slice or cut chili pepper with scissors or knife. Set aside. Peel and devein shrimp, add to a frying pan, and sauté in vegetable oil over medium-high heat with salt and pepper. Cook for approx. 2 – 4 min., until shrimp turn pink, then remove from heat and set aside. Steep glass noodles, according to package instructions, in hot water for approx. 5 – 6 min. Drain glass noodles and briefly rinse under cold water. 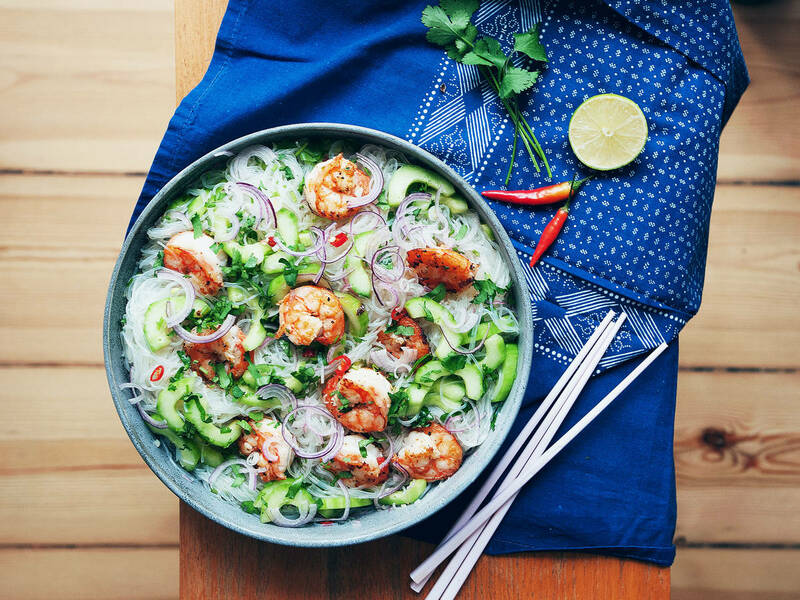 In a large bowl, combine cucumber, onion, garlic, chili pepper, toasted sesame oil, fish sauce, and lemon juice and toss. Add drained glass noodles to bowl along with shrimp. Mix everything thoroughly together. If desired, add more lime juice, sesame oil, or fish sauce to taste. Top with chopped coriander, serve and enjoy!